Whilst out on this fine launch day I noticed something rather peculiar in my local K-mart. On the shelves were the layout tags for all the upcoming blasters, and while the blasters themselves were still stowed away in the back room awaiting their debut, one of the tags in particular caught my attention. The new Nerf Proton 2 Pack. 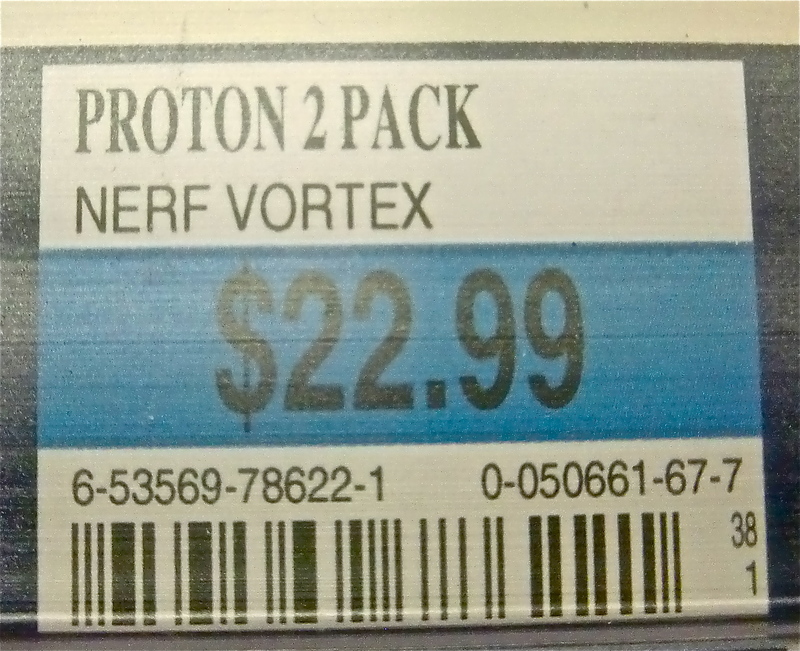 The little tag said it clear as day, Nerf will be selling Protons in 2’s from now on. Here’s the product description from the K-mart webpage. • Compact, fast-loading, single-shot disc blasters are ideal for getting you out of tight spots or blasting off final shots to win the battle! • Quick snap-load technology lets you load a disc while moving to a strategic spot on the battlefield! 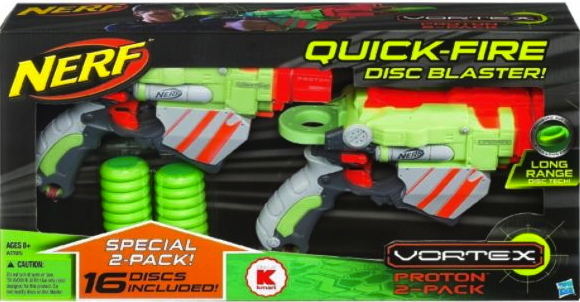 • As with all VORTEX blasters, blasters feature XLR long-range disc technology to launch discs an ultra long distance! • Ages 8 and up. • CAUTION: Do not aim at eyes or face. • TO AVOID INJURY: Use only discs designed for this product. Do not modify discs or disc blaster. VORTEX disc blasters are the cutting edge in long-range, high-powered technology, with revolutionary XLR Disc Tech that hurls ultra-distance discs for the ultimate battle experience. Both of these powerful, single-shot blasters have a Tactical Rail for you to add Tactical Rail accessories, giving you the edge in battle. Their quick snap-load technology lets you reload fast and get back in the game. Take advantage of their small size to hide them away when you need the element of surprise, then blast away with a two-fisted attack! Or give one to a friend, to be your wing man or your opponent! Kimosabi makes a Raider… pistol. Sometimes Kimosabi hurts my brain. I can’t fathom how he came up with this one, but he’s taken a Raider ~ you know, one of those big 35 dart drum, slam fire, two handed blasters that put a vulcan to shame? ~ and has turned the thing into an SMG style PISTOL. The new mini-raider now has a Deploy fore-grip, and even uses some boy scout bling as a priming handle. It still retains it’s slam fire ability and he states that it can now launch stock foam darts up to 70 feet. Wizard folks, he’s a wizard.